Maine is meeting the challenge with a wealth of eco-friendly retirement opportunities. owned by Sea Coast Management, Co.— have incorporated land preservation, green building practices, alternative energy, and recycling into their retirement developments. 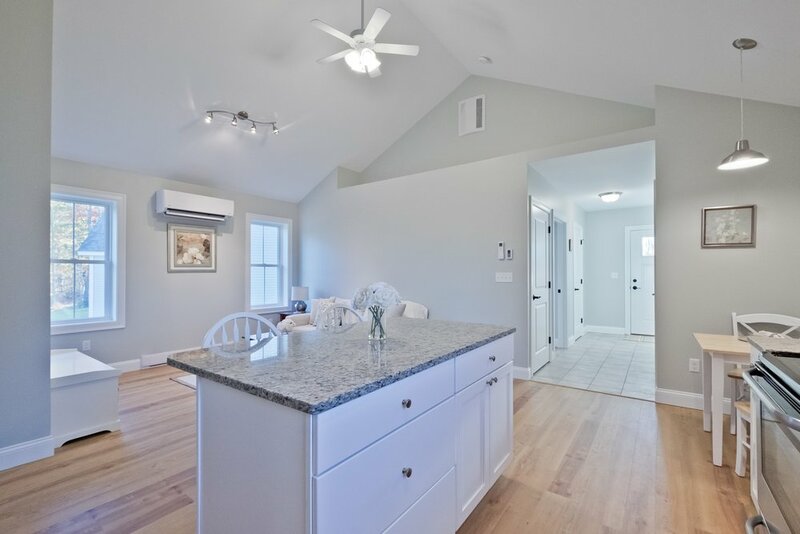 And in the Lakes Region of the western mountains, Main Eco Homes has built an entire community of small cottages with energy efficient design and eco-friendly materials. Highland Green isn’t green in name only. One-third of this active adult community’s campus has been set aside as the Cathance River Nature Preserve, 230 acres of forest and wetlands protected under a conservation easement with the Brunswick-Topsham Land Trust. In addition to enjoying the five miles of trails, residents can also volunteer for the preserve and the Cathance River Education Alliance, an environmental education organization located on the property. Highland Green’s custom homes are built with locally-sourced and sustainable materials and the community has also made a strong commitment to solar energy. A third of the recently-constructed residences at Highland Green include solar energy systems and an additional ten percent of the existing homes have already been retrofitted with solar panels. To take the commitment further, management and a core group of homeowners are in the process of planning the community’s first nine-member solar farm, and a solar charger stands ready to power up electric vehicles at the community’s restaurant. Native plants are incorporated into landscaping and residents can participate in the community garden, a project initiated by a local high school student, proceeds from which go to Midcoast Hunger Prevention. OceanView at Falmouth, a retirement community with a care continuum, employs energy efficiency building techniques, super insulation, and double- or triple-paned windows, as well as solar photovoltaic or hot water in all new construction. As older buildings are remodeled, they undergo energy efficiency retrofits and incorporate solar technology. Used building materials and appliances are donated to Habitat for Humanity’s ReStore. The dining and kitchen facilities compost food waste and diverted 35,700 pounds of organic material from the landfill last year. OceanView’s campus also includes five acres of conservation land, with wooded trails and a pond, and residents can catch the Metro bus on campus or charge their electric vehicles at the solar-powered charging station. 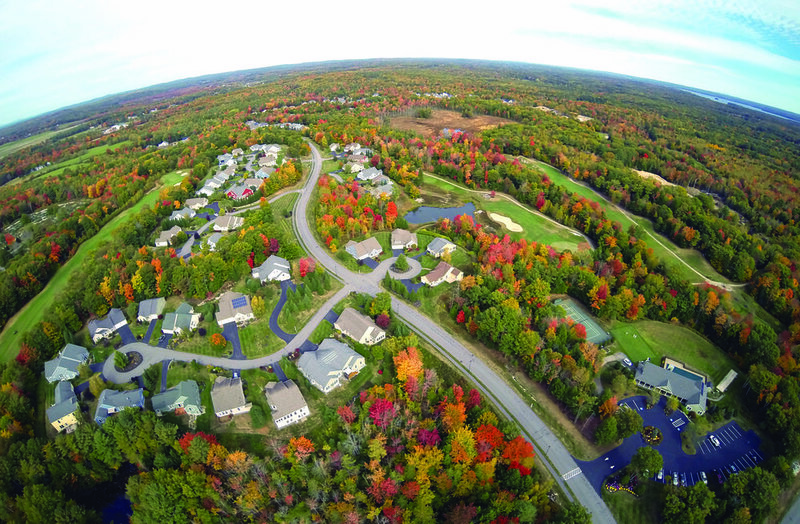 Highland Green in Topsham integrates conservation land into the community, with a third of the 635-acre campus preserved as open space. Photo courtesy of Highland Green. Development Manager Chris Wasileski says the impetus for sustainability at Highland Green and OceanView comes from both management and residents. “We have a groundswell movement of Baby Boomers who grew up with social and political involvement and aren’t afraid of letting us know when we can be doing something better.” The Cottages at Willett Brook in Bridgton is a 55+ community designed to provide an affordable, maintenance free living option for retirees in the Lakes Region. The small cottages are built by Main Eco Homes using energy efficient design and materials with an option for solar panels. The forty-acre property includes an area of open space and a shared community building with a 20-panel solar array. For retirees who like the community aspect of a retirement village but would prefer to live among neighbors of all ages, cohousing offers a great option. Clustered homes, pedestrian-friendly areas, and shared equipment make cohousing communities more sustainable than your average neighborhood. At Two-Echo Cohousing in Brunswick, the clustered homes create a spirit of neighborliness, with a central green, a common building, and 72 acres of woods, fields, and wetlands preserved as open space under a conservation easement. Belfast Cohousing & Eco-Village improves on the basic cohousing model by being the first Passive House community in the United States, with homes that use 75-90% less energy than a typical code-built home. The Eco-Village is arranged to maximize exposure to the sun for solar electric and hot water systems and each airtight home is super-insulated with triple glazed windows and a heat recovery ventilation system for fossil fuel-free heating, even in Maine’s cold winters. Often the most sustainable solution is to make use of what you already have. Several Maine communities have redeveloped historic buildings into senior housing units, avoiding the need to develop open space while locating seniors closer to services. In Falmouth, Sea Coast Management, Co. purchased the town’s former high school building and converted it into Plummer Senior Living, independent apartments for moderate income seniors. The adaptive reuse of the building included a well-insulated addition and conversion of the heating system from oil to propane. Green space and walking trails connect Plummer residents with the OceanView campus. Augusta’s former City Hall, a century-old brick building on the banks of the Kennebec River, was converted into affordable assisted living apartments by a partnership of nonprofits and government agencies. Also in Augusta, the former Cony High School building, a 1926 brick structure named The Flatiron for its odd shape, and Hodgkins Middle School, dating from 1958, have been turned into low-income senior apartments by the nonprofit Housing Initiatives of New England. Both the Cony and Hodgkins buildings are listed on the National Register of Historic Places, and the redevelopment preserved the historic buildings’ characters and repurposed materials from the schools, while incorporating energyefficient measures and natural lighting into the apartments and common spaces. Both buildings are convenient to amenities and outdoor recreation opportunities such as Augusta Nature Center, which is adjacent to Hodgkins School Apartments and Viles Arboretum, down the street from Cony Flatiron Senior Residence. As enticing as a new start may be, most retirees choose to stay in their own homes, where they’ve built up memories and a community of friends and neighbors. If you are a retiree whose home is already situated in an area that supports a multigenerational population, you’re off to a great start. Forty-five Maine towns and cities have joined the World Health Organization Global Network of Age-Friendly Cities and Communities. Elements of an Age-Friendly Community, such as walkability, public transit, and access to outdoor recreation, also contribute to making communities more environmentally sustainable. Homes that were great for families may need to be modified to be fully accessible during later years. While making these adjustments in preparation for retirement, it makes sense to also implement energyefficiency retrofits, such as insulation and air-sealing, not just for a greener home, but also for greater comfort and lower energy bills in the future. Safe streets, low cost of living, great food and entertainment, and plenty of opportunities to explore the natural world all work together to make Maine a desirable place to retire. The state’s many sustainable retirement options are an added bonus for retirees who want to manage their future energy costs, be environmentally conscientious and live in comfort.